The Asiatic wildcat (Felis silvestris ornata) is also known as the Asian Steppe wildcat or Indian Desert cat. It is a subspecies of the Wildcat. It lives mainly in the Thar Desert, and the Rann of Kutch in India and Pakistan. 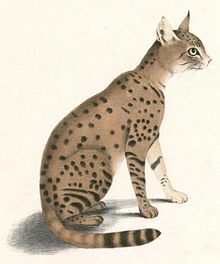 It is about the size of a domestic cat, with a pale yellowish body marked with black spots. Wikimedia Commons has media related to Felis silvestris ornata. This page was last changed on 24 May 2014, at 16:34.